I made this soup as a starter for a Shepherd's Pie. 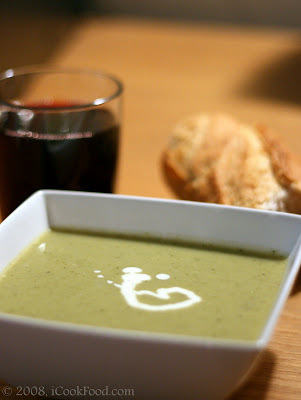 I have always wanted to try and make this soup, and although it's not as cheap to prepare as Leek and Potato, the results were pretty good for a first attempt. Marisha said that if she had been served it in a restaurant, she would have been very happy with it, especially as I didn't go too over the top on the Stilton. Still, it was a bit filling for a starter. Preparation of this is very easy. In a large heavy pan, soften the onions in the butter, then add the potato and broccoli and cook for a couple minutes. Next add the stock, cover, and simmer for about 20-25 minutes. You should then let it cool down for about 15-20 minutes and then blend the mixture until smooth. Then gently heat the soup up again, and add the cream and Stilton, stirring until all the cheese has melted. Add a decent amount of black pepper and serve immediately. If dinner guests never turn up on time, like in my case, leave this last stage until they arrive as it doesn't take long to heat the soup to get the Stilton melting.